In many cases, the latest treatments for hepatitis C virus (HCV) infection are at least 90% effective at curing the infection; however, there still remains a subset of patients who don’t respond to the new medications. Led by researchers in Germany, a study was conducted to see how ribonucleic acid (RNA) assessment can be used to predict outcomes before the end of treatment. RNA data was collected from the participants at baseline and at weeks one, two, four, eight, 12, 16, 20, and 24. RNA Levels were measured by both CobasAmpliPrep/CobasTagMan v2.0 (CAP/CTM) and Abbott RealTime HCV (ART) assays. Published in the Journal of Hepatology, the results showed that hepatitis C RNA levels in people with HCV genotype 3 who achieved sustained virologic response (SVR) were significantly lower during the first four weeks of SOF/RBV treatment than the levels observed in those who ended up relapsing. “All genotype 3 patients with a week two result of <45 IU/ml by CAP/CTM achieved SVR, but only 33% of those with >45 IU/ml” achieved SVR, the authors reported. “Similar results were documented with ART and 60 IU/ml as cut-off (SVR: 100% vs. 29%).” However, there was no significant relationship with RNA levels during early treatment and the other treatments. ART assay was able to detect residual hepatitis C RNA at later stages of treatment, but many patients still remained at SVR. For patients on SOF/SMV with or without RBV treatment, 92% achieved SVR, and ART detected hepatitis C RNA in 20% of them. 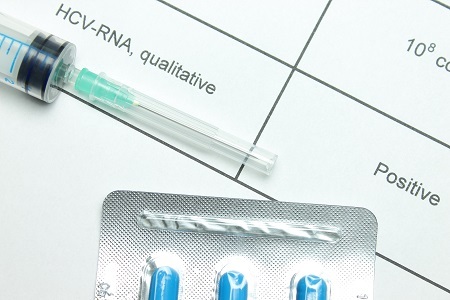 “Hepatitis C RNA levels assessed at week two of SOF/RBV therapy can predict relapse in genotype 3 patients,” the team confirmed. More sensitive ART may be able to pick up on RNA levels at later stages of SOF-based therapies, but that doesn’t not mean treatment should be extended. Interferon Combo Regimen for Hepatitis C Genotypes 2, 3?